The IAAF is yet to release results of Semenya's gender test. (CNN) -- South African runner Caster Semenya is not yet eligible to compete because of pending ruling on her gender status, the country's Olympic committee said, following reports that she has been cleared to run in races starting next month. The decision on whether Semenya, 19, may race is up to the International Association of Athletics Federations, and they have not made an announcement, said Gideon Sam, president of the South African Sports Confederation and Olympic Committee (SASCOC). "Let's be very clear on one thing," Sam said in a statement Friday. "As things stand, Caster Semenya is not eligible to run in any sanctioned meeting or race. "The matter over the results of her gender test are still sitting with the international parent association, the IAAF. They are still conducting their work and the process is ongoing. And we have to respect the privacy of the athlete, so any 'confirmation' is premature." He added, "Until the case is closed, it would be irresponsible for us to clear our world champion to compete again." Semenya won the women's 800 meters at the World Athletics Championships last August, but questions over her gender soon erupted, and the IAAF announced it would conduct gender tests. The IAAF, which governs amateur athletics worldwide, has made no announcement about the results of those tests, which would determine whether Semenya should race against men or women. Earlier in the week, Semenya's coach, Michael Seme, spoke of a competition schedule for Semenya that included women's national and international events. The Star newspaper reported Thursday, citing a spokeswoman for Athletics South Africa, that Semenya had the "green light" to compete. But Sam said the coach had "acted irresponsibly and without jurisdiction" in saying Semenya would compete against women in the forthcoming season. He also accused The Star's reporter of being "mischievous" in his dealings with the ASA spokeswoman, saying the spokeswoman only responded to the coach's remarks. "As things stand Caster is ineligible to compete, pending notification from the IAAF, which we are still waiting on," Sam said. 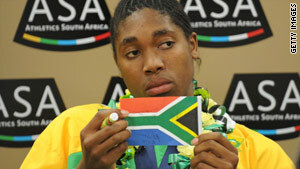 The controversy over Semenya erupted after she crushed her rivals at the August championships in Berlin, Germany. Her time of one minute, 55.45 seconds was the best women's time in the world last year. Semenya's masculine build and dominant performance fueled existing questions about her gender. Though Semenya's family, supporters and countrymen have rallied behind her and denounced the tests, the simmering speculation has, some say, permanently stained Semenya's promising career.